In a shocking move, Virginia Governor Ralph Northam announced late last week that he was dismissing three regulators from the state’s Air Pollution Control and Water Control boards who had expressed concerns about the Mountain Valley and Atlantic Coast pipeline projects, as well as a member of the Water Control Board who had voted in favor of the pipelines. 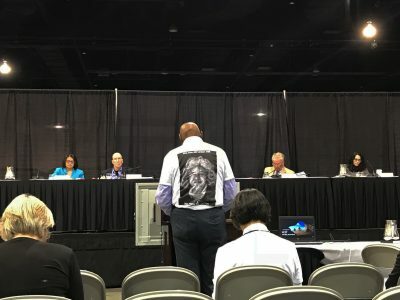 The decision came less than a week after the Air Pollution Control Board voted to delay a final permitting decision on the Atlantic Coast Pipeline’s Buckingham Compressor Station, which would site a 55,000 horsepower industrial facility in the center of a rural, majority African-American community if approved. VIRGINIA RESIDENTS: Call Gov. Northam and tell him this is unacceptable. Both Samuel Bleicher and Rebecca Rubin, the air board members being replaced, had posed tough questions to the state’s Department of Environmental Quality staff and Dominion Energy, the project developer, at a public meeting earlier in November about a permit for an air compressor station slated for Buckingham County along the Atlantic Coast Pipeline. Bleicher and Rubin both expressed concerns that the facility may have a disproportionate impact on the majority African-American community of Union Hill. Concern was also voiced about the greenhouse gas emissions from the proposed project and the underlying need for the pipeline. The air board was expected to issue a final decision on the permit at its next meeting on December 10, but Governor Northam moved to change personnel on the board before the final vote. Roberta Kellum, one of the water board members who was also informed she will be replaced, had made a motion to revoke the certificates for the controversial Mountain Valley and Atlantic Coast Pipelines at a water board meeting earlier this year (the motion did not pass). Robert Dunn, who was chair of the water board and was also dismissed, had voted in favor of the pipelines. The timing of the governor’s decision is an affront to the board, the citizens of the commonwealth, and concepts of good governance. Call the governor and tell him that Virginians deserve better!